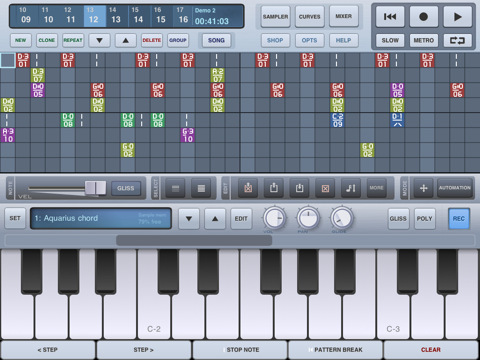 iSequence is one of the most powerful music creation studio designed exclusively for iPad. Thanks to intuitive 8-track sequencer, tons of instruments, a flexible mixer with DSP effects you can easily program and record profesional loops, beats and melodies. Now you control every aspect of your music project. The iPad edition has been rewritten and redefined to take advantage … Read Moreof a bigger screen and better performance. The workflow is extremely fluid, you can now record tracks and control movement in real-time, edit them using step sequencer and automation editor, switch between instruments, tracks and views without stopping playback. You can compose, jam and mix at the same time! Use one of 160 built-in instruments: a collection of acoustic instruments, drum kits, pads, leads, sweeps and ambient atmospheres recorded with top classic and modern hardware synthesizers. Buy additional banks in the BankShop. Play using adjustable piano keyboard or large drum pads. Record parameter changes as you move controls.